Ever since he was a kid visiting Delaware with his parents, merchant Andy Pocock said that the Delaware County Fair has always been extra exciting to him. Pocock, a Stow, Ohio resident, is the owner and operate of MR. FUN, a novelty booth, as well as several games, including a duck pond and a dart balloon game. Pocock said his parents were teachers in 1960 and said his father bought a french waffle trailer as a way to make money when school was not in session. Pocock said his parents had been coming to the Delaware County Fair since 1971, but said his great aunt Edna Heintz owned a novelty jewelry business that had been at the fair since 1936. Pocock said one of those personal friends was former Delaware County Fair Manager William “Bill” Lowe, who retired after 21 years. “He was a good friend of ours and now we are getting to meet Sandy Kuhn, the new fair manager, and see what she can do to build on the legacy of The Jug and the Delaware County Fair,” Pocock said. Pocock said he has decades of good memories from the Delaware County Fair, but specifically mentioned the Buckeye Valley Boosters food booth. “They used to be open 24 hours and that was always cool because we work late hours and sometimes we get off at 11 p.m. and we’d go get a bite to eat,” Pocock said. “We live out here on the road and we are one big family, the whole carnival is one big family,” Pocock said before pointing to and naming half a dozen other vendors. “I’ve known some of these people my whole life. This is a good group of people. “We contribute back to the local economy, we do make our living out here but we put money back into the local economy,” Pocock added. Pocock said during a typical visit he will buy lots of groceries, hundreds of dollars of fuel, and will usually have his trucks serviced while they are in Delaware. Pocock said he has no plans to stop coming to the Delaware County Fair. “This is a great fair and we love it,” Pocock said. 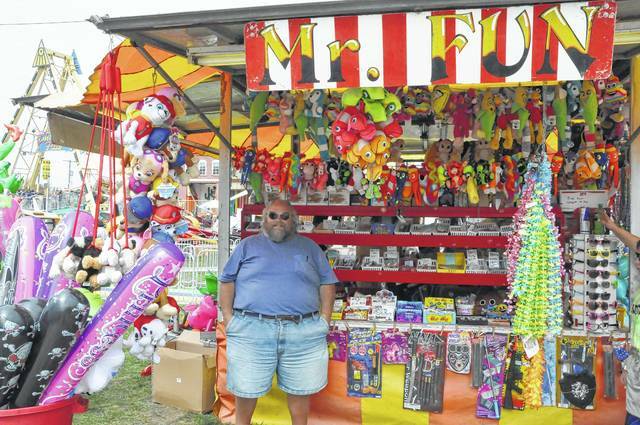 Andy Pocock, the owner and operator of MR. FUN, stands in his booth at the Delaware County Fair Monday afternoon. Pocock said his family have been at the fair since the 1930s.